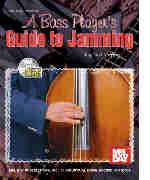 This book presents everything a beginning or intermediate upright or electric bass player needs to know to participate in a jam session. There are sections that describe how jam sessions work, and jam session etiquette. The book also describes the typical chords and keys for jamming and describes typical bluegrass rhythm. A section is included on the role each instrument plays in bluegrass rhythm. A play-along CD is included with 9 typical bluegrass jam tunes. The tunes are played twice: once with the tune played on the left channel and a verbal description on the right channel and once in stereo. John Reid teaches you the proper left and right hand techniques involved in sound production and playing of the string bass. Learn how to stand correctly with the instrument to prevent fatigue and other problems. Learn correct 'traditional' or 'classical' left hand fingerings through the use of exercises and scales.